Eldest ancestor Guillaume Lord of Croy married in 1220 Anne de Guines. His descendant Antoine de Croy (ca. 1395-1475) was an important noble at the burgundian court. He bought the lordship of Roeulx in 1429 and the castle of Château-Porcien in 1438. Through marriage he received Aerschot. 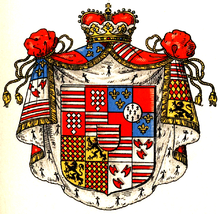 The King of France enfeoffed him with the counties of Porcien and Guines in 1455. His eldest son Philippe is the ancestor of the Dukes of Aerschot (created 1-4-1533, inherited by Arenberg) and Croy (created 1598) and Princes of Chimay (inherited 1539), extinct in the male line in 1684. Antoine´s younger son Jean inherits the lordship of Roeulx. Created counts of Roeulx 24-2-1531. This line inherits the title Duke of Croy in 1684, but dies out as well in 1767. The present Dukes of Croy descend from a younger brother of Antoine, Jean de Croy (1395-1473). His descendant Philippe de Croy (1562-1612) was created Count of Solre. Philippe Emmanuel Ferdinand de Croy, Comte de Solre (1641-1718) is created Prince de Solre in 1676. His grandson Emanuel de Croy, 3.Prince de Solre (1718-1784) becomes in 1767 7.Duc de Croy. His grandson August 9.Duc de Croy (1765-1822) receives in 1803 Dülmen as compensation for immediate territories annexed by France. Dülmen is mediatised in 1806 as part of Arenberg. 70. Ernest Engelbert Prins en Hertog van Arenberg * 25-5-1777 + 20-11-1857; Zn van Auguste Marie Raimond Prins en Hertog van A. 103. Maria Alexeieivna Spiridova * … + …; Dr van Alexei Grigorievitch S.